Notes: Dixon #70. Bar Rep. 56. Butler Vol. 3. Map 45.16 (diagram p.51). Grinsell WALKHAMPTON 9. Notes: Turner E20. Dixon #61. Bar Rep. 54. Butler Leather Tor S. - Vol. 3. Map 45.17 (diagram p.52). Grinsell WALKHAMPTON 25. 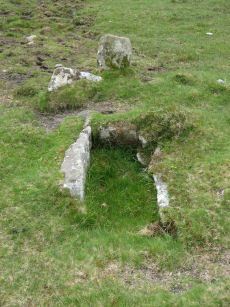 "A cist, consisting of two side stones and an end stone, contained within a barrow surrounded by a 16ft 6 ins diameter Kerb circle." 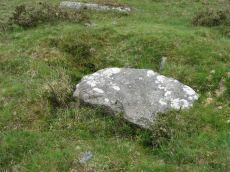 Notes: Routrundle North Pound: "Broadly oval enclosure, 58 by 48 metres diameter. 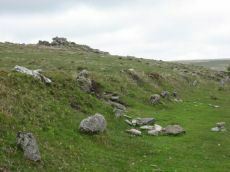 Part of the south-west perimeter is represented by a stony scarp 0.5 metres high, elsewhere it comprises a stone spread of similar height upon which is a modern field wall." 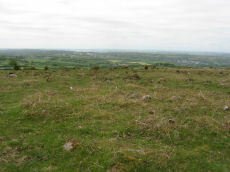 Notes: Routrundle South Pound: "A roughly oval field with diameters of 58.0 metres by 64.0 metres and a modern perimeter wall 1.5 metres high. 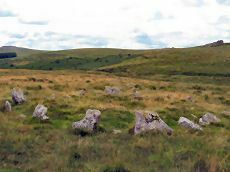 There are no obvious footings of a previous wall but the plan and size (0.25 hectares) suggest that it is the fossilization of a prehistoric enclosure similar to that 250 metres to the north-east." Notes: Turner E41 - Sharpitor (N). Dixon Peek Hill #103. Bar Rep. 72 (TDA Vol 88 p.222). Butler Sharpitor N. - Vol. 3. Map 45.12 (diagram p.45 & photo p.84). Grinsell WALKHAMPTON 21. Notes: Described by Worth as "Sharpitor, foot of eastern slope". Listed by Butler as Sharpitor N.E. (which can be confused with another alleged row). 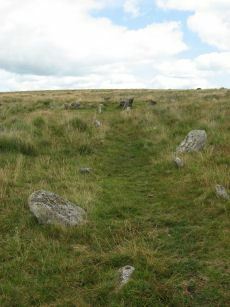 "A stone row, with a cairn at the west end at SX 56147078, extends almost due west for 26.0m. to SX 56167078. 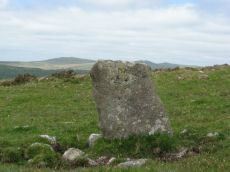 The cairn, mutilated and amorphous, is now approximately 6.7m in diameter and 0.3m. high at its maximum. There are nine stones in the row, including three pairs, with an additional stone which seems to be displaced, all between 0.1m. and 0.3m. high. The east end of the row is terminated by a reave (SX 67 SE 91) which has cut across and evidently destroyed any westward extension." Lethbridge pp.20-22. 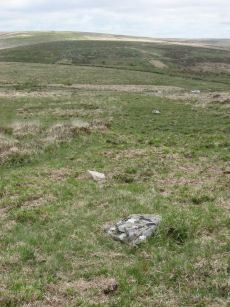 Notes: "The cairn lies on a gentle sw slope ne of horseyeatt farm, with a stone row see sx57se/141 running sw from it. 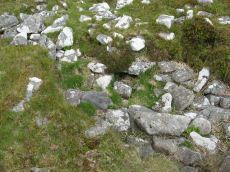 The cairn is about 7m in diameter and 0.6m height, partly turf-covered, with a central hollow. 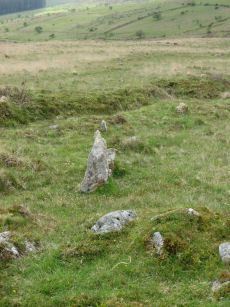 The visible set stones within the cairn suggest two or three underlying concentric stone circles. 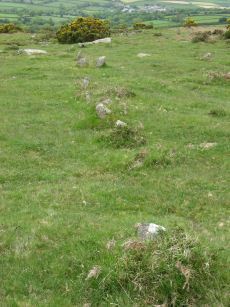 These stones have a maximum height of 0.2m and are predominantly set with their long axes tangential to the circle". Lethbridge pp.19-20, diagram p.19.